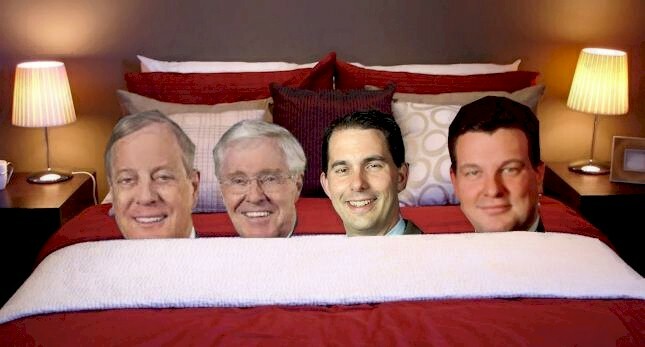 The Midnight Review: Are Scott Walker, Jeff Plale Conspiring To Sell State Power Plants To Koch Brothers? Are Scott Walker, Jeff Plale Conspiring To Sell State Power Plants To Koch Brothers? With the release of the audio recording of Wisconsin Governor Scott Walker eagerly accepting a call from who he thought was one of the billionaire Koch brothers, a possible connection has been made between the governor and the billionaire industrialists that goes far beyond the contributions the Koch brothers made to the Walker campaign last year - in a move to privatize the energy sector, Walker and his administration prevented Democratic-proposed amendments to legislation that would allow the governor to sell state-owned power plants without bids, Walker and his administration open up the possibilities that Koch Industries. Assembly Democrats tried but failed Wednesday to prevent Gov. Scott Walker from selling state-owned power plants without bids amid growing concerns by Democrats that the owners of a multi-billion dollar oil-and-gas company are driving the governor's legislative agenda. That suspicion grew Wednesday after Walker was secretly recorded revealing his strategy for pushing through his anti-union budget repair bill during a 20-minute phone conversation with a blogger who purported to be David Koch, executive vice president of the Wichita, Kan.-based Koch Industries. The defeated amendment, which would have required that the sale be approved by the Public Service Commission, is among dozens likely to be shot down by the Assembly's Republican majority. The $43 billion Koch Industries, which Koch owns with his brother, Charles, includes numerous energy-related enterprises, including a natural gas pipeline, refineries and a company that supplies coal to Wisconsin power plants. At a news conference Wednesday, Walker denied any connection between the sale of the state's 32 power plants and the Kochs' support. Walker isn't the only one denying such connections - Jeff Plale, director of the state Division of State Facilities, also played ignorant to any possible connections. "I don't know those guys at all," said Plale. "I wouldn't know them if they walked into my office. I don't know anything about the relationship between the governor and them." This is interesting because Plale, a Democrat who supported Walker and is believed to have received his recent position as a political favor for opposing union contract legislation last year and supporting privatization of Wisconsin's energy sector, received money from a Koch lobbyist last year, and if you weren't aware, the Koch's recently opened a lobbying office in downtown Madison. The Kochs have insisted that they have no interest in the power plants for sale and that the actions of Walker's administration are of no concern to them, but why would they open a lobbying office in the capitol and why are they linked to funding the campaigns of both Governor Walker and Jeff Plale?